After birding Port Melbourne Beach I continued on along the coast to Sandridge Beach, which did not offer the number of Pacific Gulls or Silver Gulls that had been present earlier. I then took the trail beside Todd Road to get to Westgate Park. There were several detours in place due to road construction, but it did lead me straight into Westgate Park. The first water body that I came to was the lake that is saltwater and pink in colour. 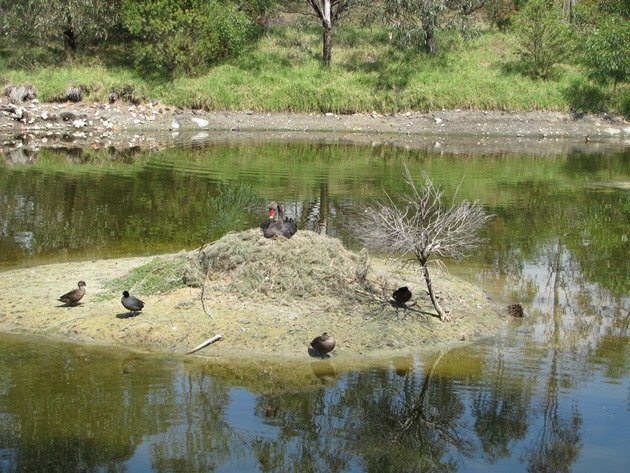 It is believed to be caused by the natural interaction of a single cell green alga Dunaliella salina and a halobacterium Halobacteria cutirubrum. 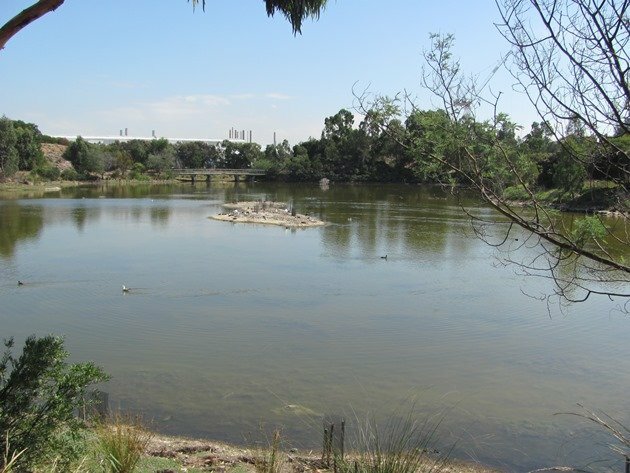 Due to the high salt content, temperature and light the green alga grows on the bottom of the lake and produces the red pigment beta carotene. The first birds that I observed were Superb Fairywrens and they are abundant in the park. White-browed Scrubwrens are also abundant in the undergrowth along with the Common Blackbird. 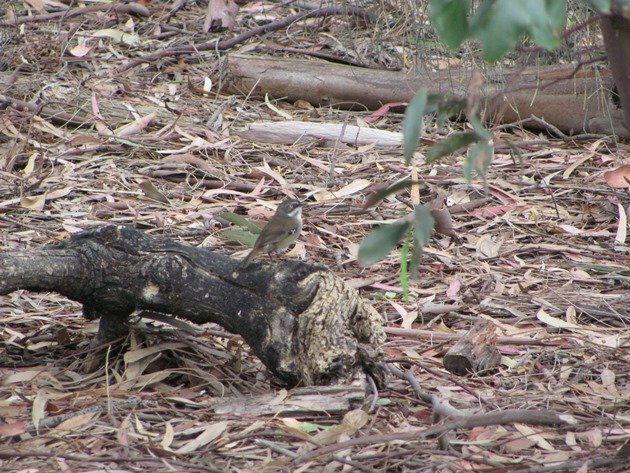 Despite the White-browed Scrubwrens being fast moving little birds I was able to obtain one photo while a bird hopped through the heavy bush. There are several trails around the park and I wandered around many of them. 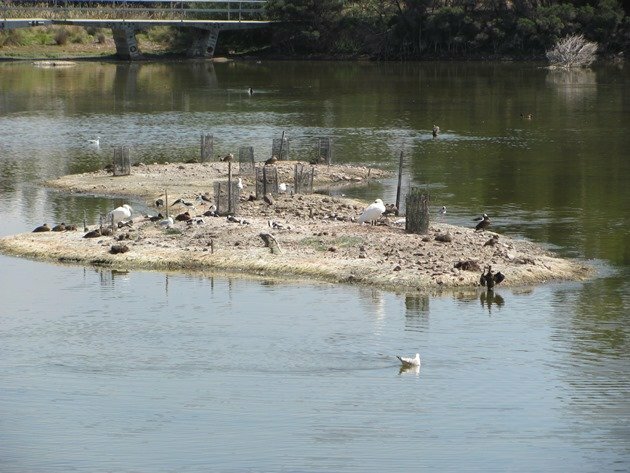 There was a large island in the centre of the lake that was a roost site to many species of birds. 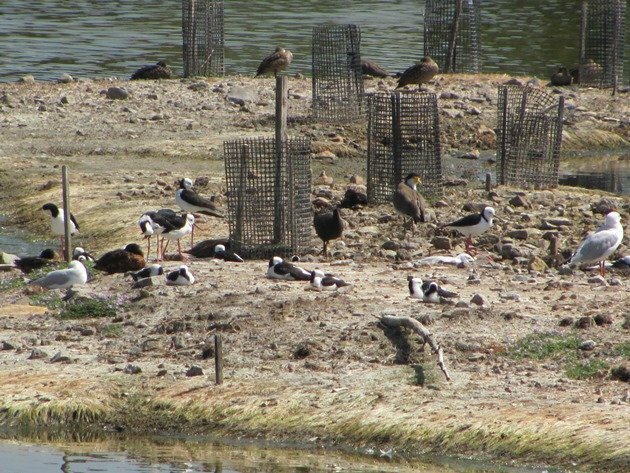 There were two Royal Spoonbills present and a pair of Masked Lapwings, but the majority of the birds were Black-winged Stilt with twenty two birds present. 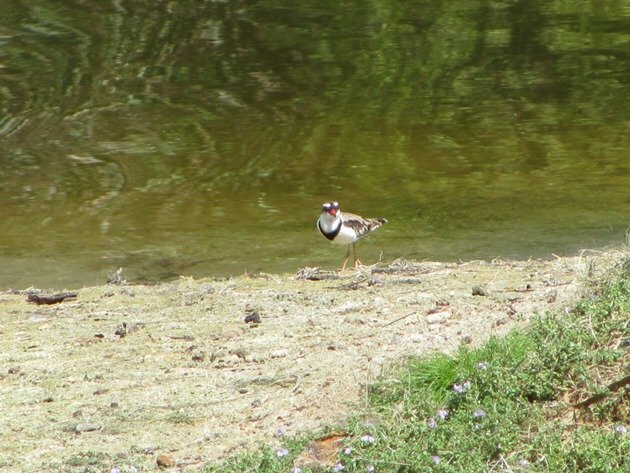 A pair of Red-kneed Dotterels and Black-fronted Dotterels were present and a Common Sandpiper was a nice addition to my Melbourne City bird list! The majority of the ducks that I observed that day were Chestnut Teal, but Pacific Black Ducks were also present. Purple Swamphens, Eurasian Coots and Dusky Moorhens were in good numbers and I added Hoary-headed Grebes to my Melbourne City bird list. 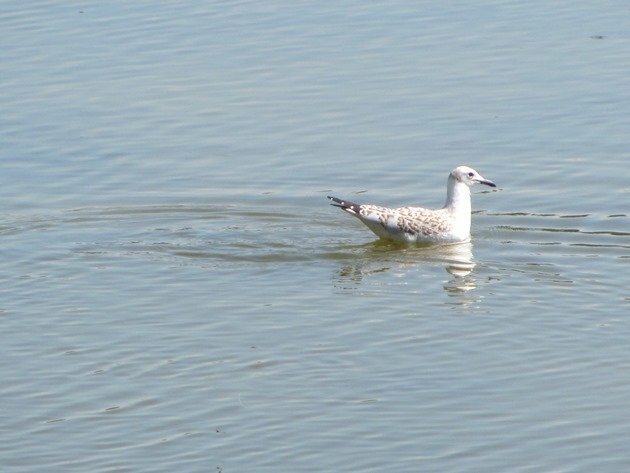 A juvenile Silver Gull was paddling around near the island and there were a pair of adult Silver Gulls roosting on the island. Welcome Swallows were constantly swooping over the water and the most common honeyeaters were the New Holland Honeyeater, with White-plumed Honeyeaters and Red Wattlebirds also present. Willie Wagtails were in good numbers and also Spotted Doves. Rainbow Lorikeets screamed by overhead and there were a few Noisy Miners present in the park. 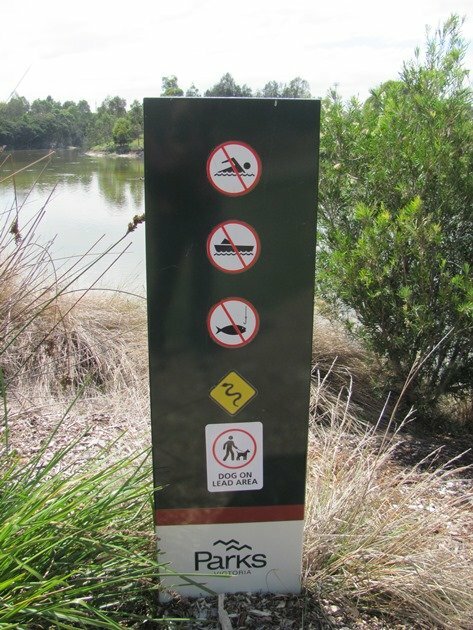 Of course there are dangers in this park, despite being in the city and there was a warning about snakes. However, I did not observe one, so there is no photo! 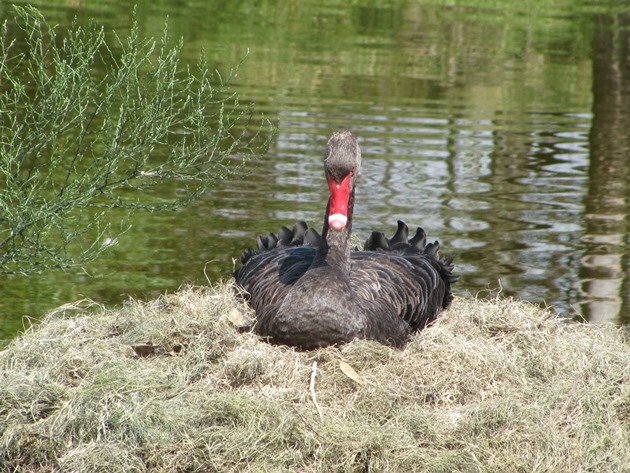 One small island was home to what appears to be a nesting Black Swan, with a partner nearby and also Chestnut Teal, Eurasian Coot and a lone Black-fronted Dotterel. 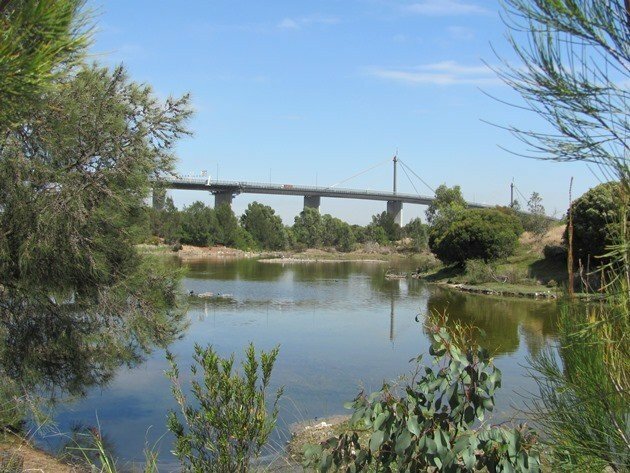 There is an excellent website with a lot of information on Westgate Park, which is put together by a group of people who are making sure that the park is cared for. They do bird surveys on a regular basis according to the website and have been planting trees, weeded the vast area and mulching. It appears to be a never-ending task for a group of people who truly care about this piece of land in between highways and industry. They are doing a magnificent job and there is no doubt that the wildlife appreciates all that they are doing. I did not spend nearly enough time at Westgate Park and I will be returning! A Latham’s Snipe was present this week and that would be a nice bird to get onto my 2015 year list! I had about an hour’s walk to get back to the city and chose to walk along Todd Road, followed by Lorimer Street which is an industrial area. I could re-join the banks of the Yarra River and had the pleasure of a pair of Peregrine Falcons among the tall buildings on the south side of the river. 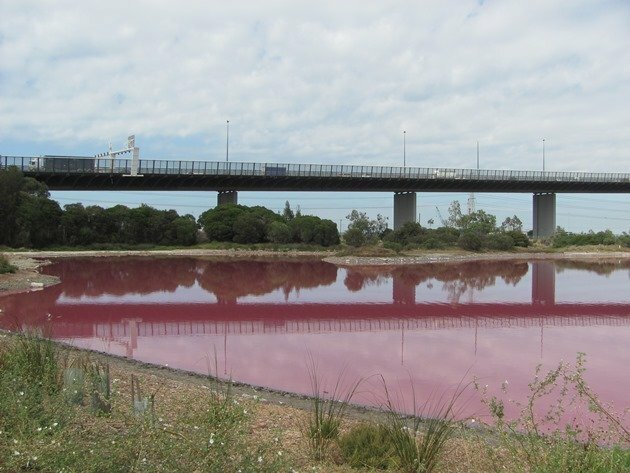 What if the pink in Pink Lake is the result of frequent feeding frenzies of the as yet undiscovered Bull Sharks living there? Where Are You Birding This First Weekend of July 2010?